Okay, this old ad has thrown me for a loop. 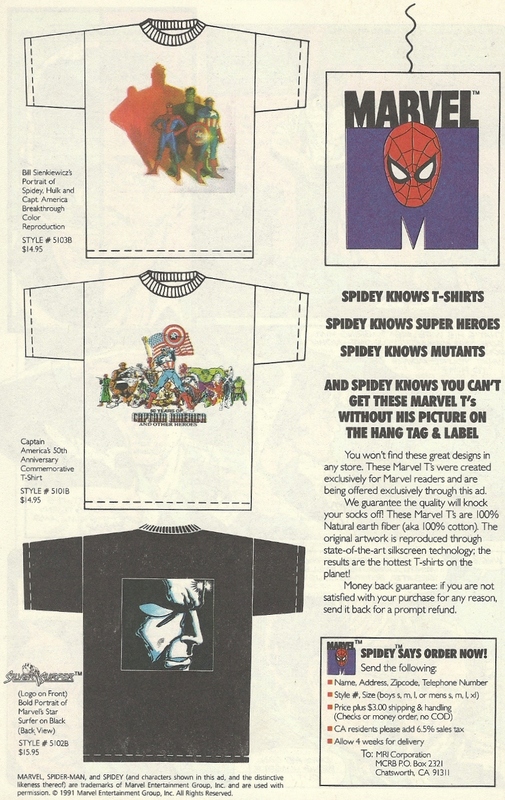 I looked at it, saw that (cool, sweet, boss) Silver Surfer t-shirt there at the bottom, and was suddenly flooded with fond recollections of a similar one that I owned that had the Ron Lim Surfer on the back. But then I thought about it more, and I started to question whether or not I actually owned such a thing. I think I might have seen one for sale and, fantasizing about how gobsmackingly awesome it was and how with me wearing it men would want to be my friend and women would want to be my lover, envisioned it covering my bony adolescent frame. The potent dream might have crafted the memory. I really don’t know which is the truth.